I decided to try out OPI Ali's Big Break first from my swap with Alice that I showed you the other day. I was going for a Burlesque look but I think it turned out more festive than Burlesque haha. Keep in mind I haven't seen the movie yet so I was just going off my impression of the movie so it was a bit of a fail! I think this design would be ideal for Christmas or Chinese New Year which is coming up. 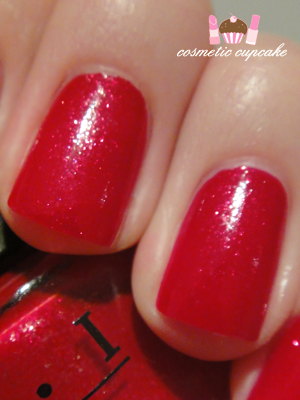 Ali's Big Break is a bright red packed with gold micro glitter. It is so gorgeous and festive! I love having bright and fun nails to look at during the day =) I do like the Prowide brushes but sometimes they just don't want to cooperate with me and that was certainly the case for Ali's Big Break. The brush just wouldn't behave! ARGH. It applied very smoothly though and dried to a glossy finish. Pictured below is 2 coats without topcoat. 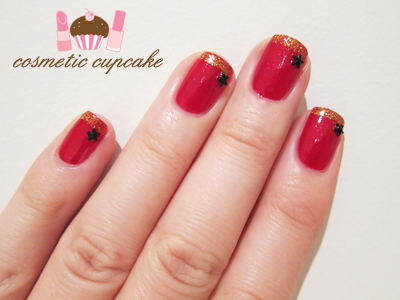 I then freehanded gold tips using Art Deco striper polish in gold glitter and added a black star rhinestone to each nail. Topped it off with a coat of Color Club Vivid Color Intensifying topcoat. Thank you for adding another Burlesque polish to my collection Alice!! What's your favourite polish from the OPI Burlesque range? Whhhheeeerreeeee do you get the little black stars from!? SO cute!! Do they knock off easily, like at work when you're doing patient stuff? It looks a little bit more like Christmas than CNY with the black stars. I've been thinking of what to do with my nails for CNY too! I don't know how I would work red and gold. such a gorgeous NOTD. they look sooo pretty! Yes, it's definitely perfect for Chinese New Year! nice lovely color on the nails best for any girl. Simple, but cute! I agree, it would be perfect for Christmas. 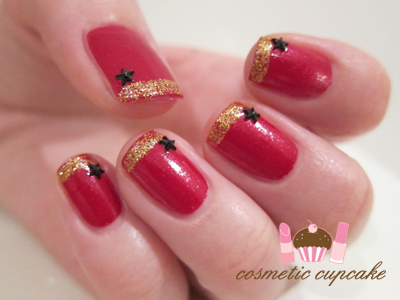 This will make a good chinese new year manicure! Actually I would have to say that the glitter from this collection has got to be my favorites! I'm so obsessed with glitters right now! @Mez: I got them from eBay! I can't remember the seller but the stars were in one of those nail wheels with lots of different rhinestones. Nope they don't fall off for me while at work. They actually stay on REALLY well and I have to pry them off when I'm removing my polish. It's when I'm changing that they have a tendency to fall off! @Martje: Yeah they're lots of fun! They're 3D too hehe. @Concepteur de Chocolat: OPI definitely have some wonderful polishes. I found this polish to last for some time without chips! @Danielle: Thanks Danielle =D I've only had time for simple manis lately unfortunately. @Alice: I love the glitters the most too! They are just spectacular and just look sooooooooo good. Ali's Big Break is such a gorgeous red so it's high on my favourites too for OPI!